Bring your own water, as potable water is not available. Campfires are not permitted throughout the marine parks; observe posted signs. For additional information: McGrath Contracting Ltd. This park is a boater’s paradise at the confluence of Malaspina Inlet and Homfray Channel. Yachters have been enjoying the spectacular vistas and calm waters for generations. In recent years, kayakers have enjoyed exploring the islands and coves that make up the unique shoreline. Desolation Sound Marine Provincial Park has more than 60 km of shoreline, several islands, numerous small bays and snug coves. The warm waters of the park are ideal for swimming and scuba diving; the forested upland offers a shady refuge of trails and small lakes and designated campgrounds. This park can be split up into three major destination anchorages: Prideaux Haven, Tenedo’s Bay and Grace Harbour. Desolation Sound is a very popular kayak and boating destination. There are 11 designated campgrounds throughout Desolation Sound, the Copeland Islands and Malaspina Provincial Marine Parks. These three parks are grouped together for the backcountry registration system and described as Desolation Sound Parks. BC Parks’ Discover Camping Backcountry Registration System allows you to purchase a backcountry permit before leaving home. Although the system does not reserve a campsite, the system provides visitors the convenience of prepaying for their trip and not having to carry cash. We encourage all visitors to register online so we can reduce the need to collect fees in the field. If the online system is not available to you then you can pay with cash at Okeover Park or Lund Harbour. Look for the registration information at the BC Parks kiosks. A Desolation Sound Parks backcountry registration is valid for overnight use in the Copeland Islands, Malaspina, Roscoe Bay, and Desolation Sound Provincial Marine Parks. Detailed information about the campgrounds and campground maps. Most kayaker and boaters launch their vessels and start their adventure from either Lund Harbour or Okeover Harbour Government Dock to access the Desolation Sound Parks. Many boaters will arrive by boat from Georgia Strait. Okeover Provincial Park is located next to the Okeover Harbour Government Dock. There are 21 vehicle access campsites at Okeover Provincial Park. Many people will camp at Okeover Park and get an early start the next day to explore the Desolation Sound Parks. There is a campground attendant at Okeover Park. Camping at Okeover is captured under a separate fee and is not on the backcountry registration system. Kayak Rentals and Guided Tours: There are several kayak rentals available in the Powell River and the Lund area. There are several guided kayak tours available. All guided visitors are required to pay overnight camping fees, in addition to any guiding fees. Please discuss with your guide outfitter prior to your trip. Parking: There is limited free parking near to Okeover Park and boat launch. Private pay parking is also available in Lund Harbour. New for 2014: Backcountry Camping fees now in place for Desolation Sound Parks backcountry campgrounds (includes Desolation Sound Marine, Copeland Islands Marine, Malaspina and Roscoe Bay Provincial Parks) from June 1st to September 15th. To purchase a backcountry camping permit, click on the “Get A Backcountry Camping Permit Now” button. Thank you for your support! BC Parks is implementing a designated campsite policy to protect the sensitive areas of the park. These marine parks protect globally significant ecological and cultural park values. Recreational activities have caused inadvertent negative impacts to sensitive park areas. Please enjoy the designated campgrounds identified on this map [PDF]. Both Roscoe Bay and Prideaux Haven are closed to sewage discharge under federal regulation. The federal regulation also prohibits the discharge of sewage while at anchor in any waters; it is also prohibited to discharge sewage within 3 nautical miles from shore. The federal regulation preventing the discharge of sewage is Regulations for the Prevention of Pollution from Ships and for Dangerous Chemicals. For information on green boating please visit the Georgia Strait Alliance web page. There is a sewage pump-out station located in Lund at the public dock. In addition, to help preserve the natural values in this park, we ask that vessels do not discharge sewage in any anchorages, but keep sewage contained in holding tanks while at anchor. This park contains parcels of private land (these parcels are noted on the brochure map). Please do not trespass. North of Powell River and Lund on the Sunshine Coast; 90 miles north of Vancouver. Lund is the closest community, town or city. Boat Launch and Kayak Launch: Most kayakers and boaters launch their vessels and start their adventure from either Lund Harbor or Okeover Harbor Government Dock to access Desolation Marine Park. Okeover Provincial Park is located next to the Okeover Harbor Government Dock. There are 21 vehicle access campsites at Okeover Provincial Park. Prideaux Haven: Strategically located as a base for exploring the Sound, this anchorage is an elongated bay dotted with islands and small coves at the far north end of the park. A pit toilet is also located here. There is no camping allowed in this area. This is a very popular anchorage. Yachters are reminded that it is illegal to dump sewage in the protected waters of Desolation Sound Provincial Park. Tenedos Bay: A sheltered bay east of Mink Island in Homfrey Channel. Nearby Unwin Lake provides a great opportunity for a freshwater swim. Tenedos Bay is a designated campsite with pit toilets and an information shelter is located here. Yachters are reminded that it is illegal to dump sewage in the protected waters of Desolation Sound Provincial Park. Grace Harbour: A large sheltered bay located in Malaspina Inlet and surrounded by Gifford Peninsula. This area provides pit toilets, designated camp sites, an information shelter and an upland hiking shelter. 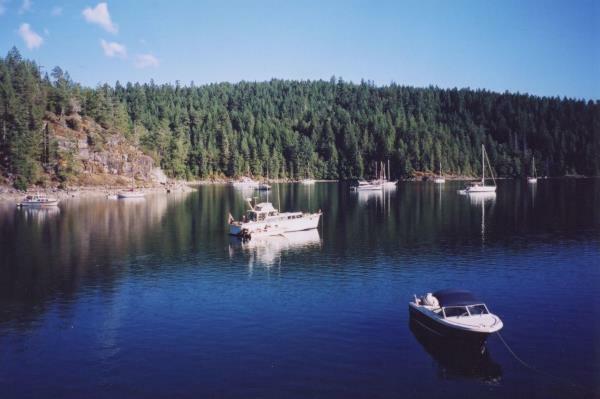 Yachters are reminded that it is illegal to dump sewage in the protected waters of Desolation Sound Provincial Park. History: Desolation Sound falls within the traditional territories of the Sliammon, Hamalco, and Klahoose First Nations. The First Nations have occupied many sites throughout Desolation Sound for thousands of years. The First Nations still rely on the abundant sea life in waters of Desolation Sound to harvest traditional foods. Captain George Vancouver first sailed these waters in 1792 – and seeing the land and seascape so remote and forbidding, he was inspired to name it Desolation Sound. The park was created in 1973 and continues to be a popular destination in the marine park system. Conservation: Due to dry and shallow soils, many areas within this park can be easily impacted by human use; please refer to the Outdoor and Marine Ethics section under General Wildlife, Marine and Outdoor Ethics Information. NOTICE: BC Parks has recently introduced a designated campsite policy for Desolation Sound, the Copeland Islands and Malaspina Provincial Parks. The Park Master Plan supports and guides the implementation of a designated camping policy. However, the maps in the management plan of the designated campsites location have not been updated. Please see the updated map for designated camping [PDF]. The plan also includes Copeland Islands and Okeover Arm Provincial Parks. This is a very popular kayak destination. There are 11 designated campsites throughout Desolation Sound, the Copeland Islands and Malaspina Provincial Marine Park. There are several kayak rentals available in the Powell River and Lund area. There are numerous guided kayak tours available. Most kayaker and boaters launch their vessels and start their adventure from either Lund Harbor or Okeover Harbor Government Dock to access Desolation Marine Park. Okeover Provincial Park is located next to the Okeover Harbor Government Dock. There are 21 vehicle access campsites at Okeover Provincial Park. There are several fishing opportunities in this park including both saltwater and freshwater fishing for salmon, rockfish, oysters, prawns, cod, snapper etc. The Department Of Fisheries routinely monitors the level of marine biotoxins, bacteria and other harmful contaminants and closes bivalve shellfish areas when levels of these substances exceed safe limits. When an area is officially “closed,” it is illegal and unsafe to harvest in that area. As a general rule, areas that have been assessed and deemed contaminated are clearly posted with signs indicating the area is closed. It is your responsibility to find out if an area is closed to shellfish harvesting. Desolation Sound and Copland Island Provincial Marine Parks are within Rockfish Conservation Areas (RCAs). Hook and line fishing is not permitted in RCAs. Fishing activities are limited in RCAs. Before you go fishing please refer to the Rockfish Conservation Area descriptions available from Fisheries and Oceans Canada DFO. Anyone fishing or angling in British Columbia must have an appropriate licence. Click here for information about Fishing and Shellfish Harvesting. There is a short hiking trail to Unwin Lake from Tenedos Bay. This is an easy 10 minute walk one way. For your safety and the preservation of the park, obey posted signs and keep to designated trails. Shortcutting trails destroys plant life and soil structure. There are SCUBA diving and snorkelling opportunities in the park but there are no facilities available. Divers must be self-sufficient. There are no designated swimming areas in the park. Fresh water swimming is available at Unwin Lake located about a 10 minute walk from Tenedoes Bay. Please do not use soaps or shampoos in the Unwin Lake or the creek that flows into Tenedoes Bay. There are no lifeguards on duty at provincial parks. Pit toilets are located at Grace Harbor, Tenedos Bay, Curme Islands, Bold Head, Hare Point, Feather Cove, Copeland Islands, and Melanie Cove. There are no flush toilets. 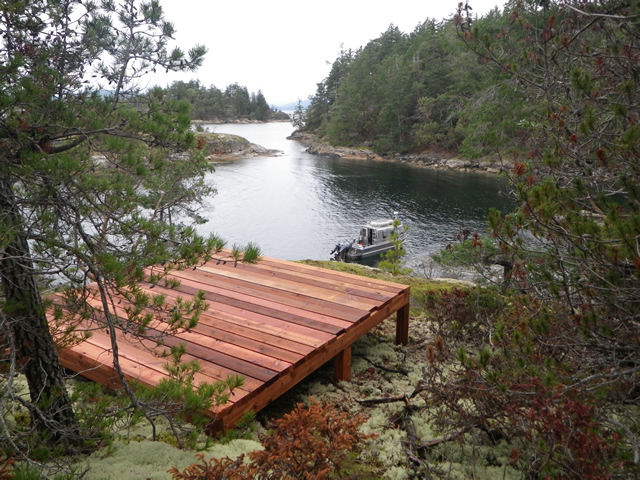 Many of the outhouses throughout Desolation Sound are an open-air-privy design. This simple outhouse design is a cost effective way of providing a sanitary camping experience. While the open-air-privy design experience may be slightly more adventurous than the traditional outhouse building, it will also provide a much more pleasant view and allow for a fresh air experience. Please bring your own toilet paper. Please note that all outhouses in Desolation Sound have above ground pump out tanks. Due to the shallow soils and potential for exposing cultural features buried in the ground, digging traditional outhouse holes is not possible. Please do not put garbage in the outhouse tanks! It is very costly to pump out tanks, so please only human waste in the tanks. There are 11 designated campgrounds [PDF] throughout Desolation Sound, the Copeland Islands and Malaspina Provincial Marine Parks. There is an average of 9 tent pads at each campground. Details about these campgrounds, including campground maps, access descriptions, facilities and features, are available here. Camping is only permitted in designated campsites. Campers must use tent pads, please prevent erosion by placing tents, and other equipment on the tent pads. Campsites are available on a first-come, first-served basis. Please do not hold sites for other parties. These parks protect very sensitive ecosystem values. Please stay on designated routes to avoid causing damage to these park values. Fees are collected from June 1st to September 15th. BC Parks Discover Camping Backcountry Registration System allows you to purchase a backcountry camping permit before leaving home. Although the system does not reserve a campsite, the system provides visitors the convenience of prepaying for their trip and not having to carry cash. We encourage all visitors to register online so we can reduce the need to collect fees in the field.